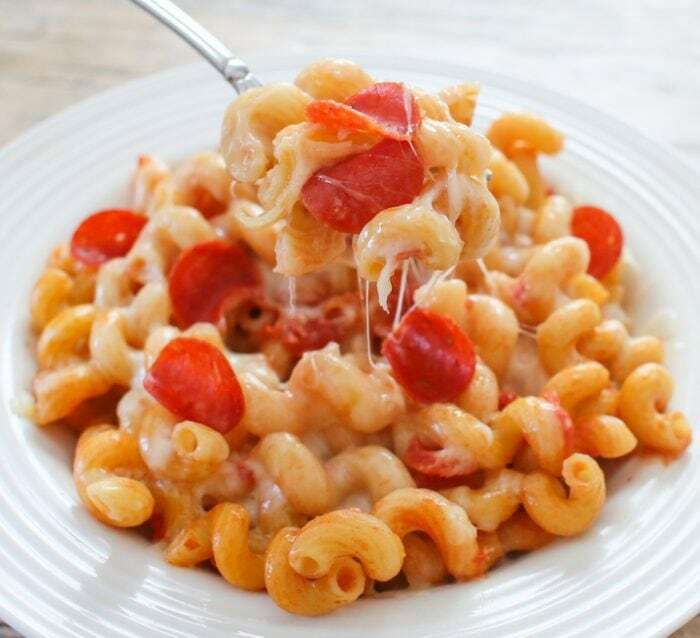 One pot + two main steps = delicious pepperoni and melted cheese pizza pasta. 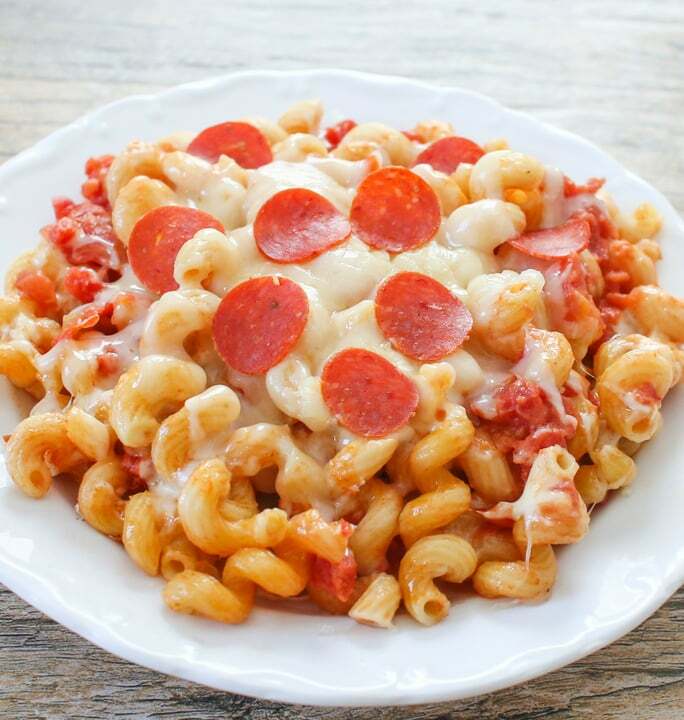 I’ve been wanting to make a pepperoni pizza-themed pasta for quite a while and here it is. 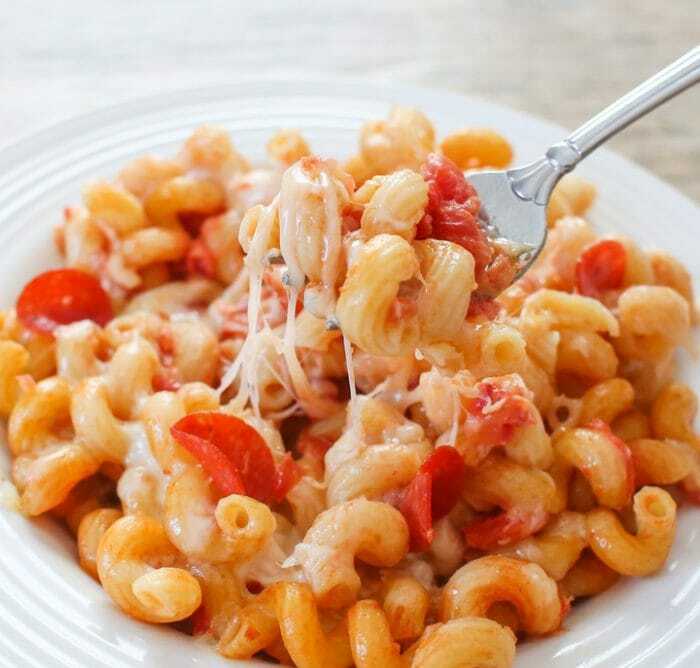 I just love how the melted mozzarella cheese stretches over the noodles. I thought of a story while I was making this to include in this blog post, but I can’t remember it anymore. Forgetfulness has plagued me a lot lately. I don’t know if it is age or what. I remember I used to be amused when I saw a kid go upstairs to fetch something and then completely forget what he was doing. And now I find myself doing the exact same thing. There have been so many moments the last few weeks where I run upstairs to grab something in my room, or I go get my phone from my purse, and then I can’t remember why I went to my room, needed my phone, etc. Luckily, I remembered to make this pasta because I really enjoyed the results. I love one pot pastas. They save so much time and clean-up. 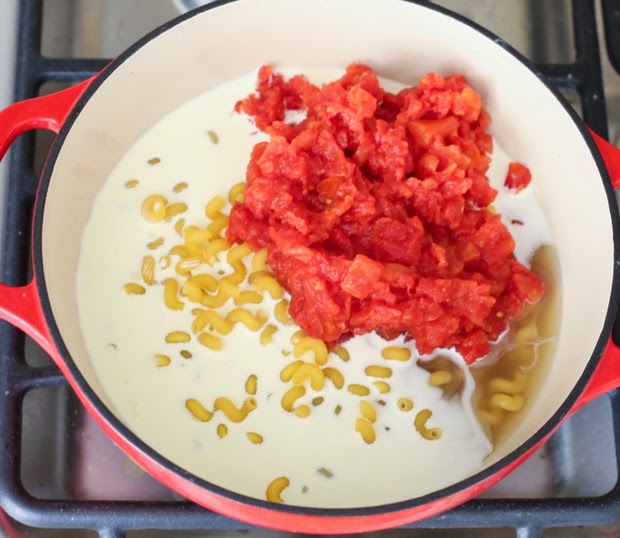 Throw everything in a pot and it cooks itself, producing fully cooked pasta in creamy tomato sauce. I should have taken a picture once it was done because everything was mixed and ready, like magic. 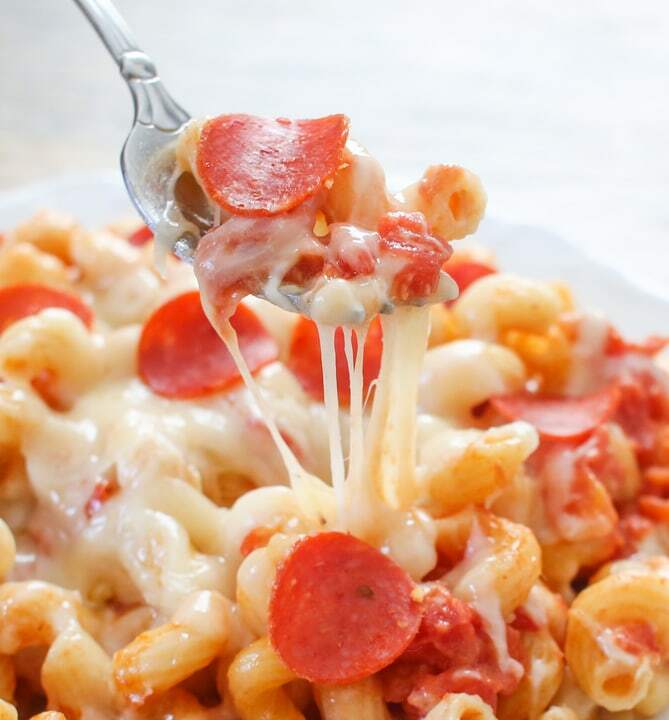 For the pizza part, I added the shredded mozzarella and pepperoni last, straight onto the just finished pasta, so that it melts and blends in. Each bite is cheesy bliss. I also sprinkled on some Parmesan cheese too, just like I do with my pizza. 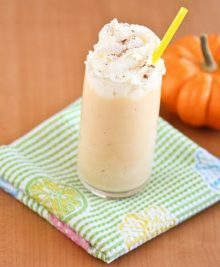 This recipe is Mr. K approved and I guess that means something because he’s only given me the “it’s okay” nod for the last few recipes I’ve made. Add pasta, broth, tomatoes and heavy cream into a large pot (I used my 3-quart dutch oven which was the perfect size). 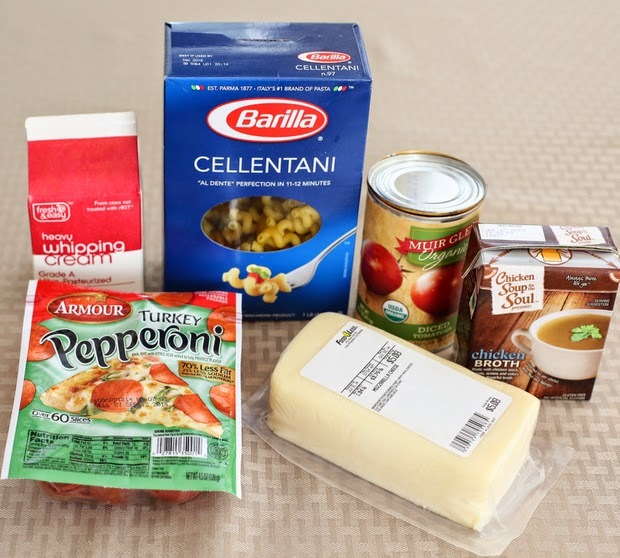 Bring to a boil, stirring a few times to mix all ingredients and keep pasta from sticking to the bottom. Keep lid slightly open and cook at a medium boil for about 10 minutes or until noodles are ready, checking and stirring occasionally. Most of the liquid should have evaporated. If it still seems watery, remove lid and let pasta continue to cook for a few minutes, letting most of the liquid evaporate. Stir in shredded cheese and pepperoni and serve immediately. Top each plate with additional cheese and pepperoni if desired to get the "pizza look." Wow! 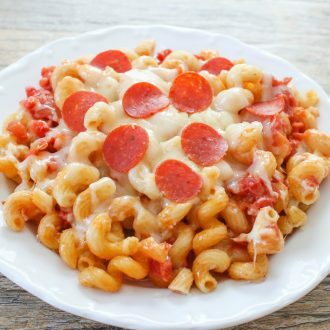 Love the idea of pizza pasta! Mouthwatering dish! This is SO our kind of meal, what an awesome idea!! I’ve been inspired by all your great meal ideas! oooh looks delicious, definitely craving a bowl right now! we really enjoyed this one! oooh, i love recipes like this !! can i change the chicken broth for water ?